The experience gained from the three-day Windsor-Detroit Hacking Health event was the real prize, but a combined team of students and health-care professionals from Leamington decided if you’re in it you might as well win it. The decision by the Leamington District Memorial Hospital and Leamington District Secondary School to partner proved an inspired one when the locals walked away with top spot and $12,000 worth of awards this past weekend. on the team along with Alyson Skidmore, Tam Do and JoAnn Weil. The Leamington team’s goal was to create a mental health app for teenagers to help them chart their experiences and communicate that information to their health-care provider. It would also serve as an electronic medical file. They knew they might be onto something special Friday when the Leamington team received an avalanche of offers from skilled people looking to aid them in bringing their idea to life. Four members of St. Clair College’s Web Club (Meghan O’Donnell, Meagan Park, Colin Thompson and Lori Dunford) offered up their webpage designing and animation skills. They also drew the interest of Tony Potts, director, strategy and operations, McKesson health solutions, and Al Carpinelli, account executive, logic solutions and MTAM Health Advisory Council board member. In all, 15 people formed the Leamington team making it the largest one to ever be assembled at a Hacking Health event. Having done a lot of the groundwork in advance, the Leamington team was able to break up into design, business side and presentation groups. The judges were particularly impressed with the innovative idea of including high school students in the creative process. Lauren Omstead, who was a software developer before becoming a computer science teacher at Leamington, marvelled at the role her students played. 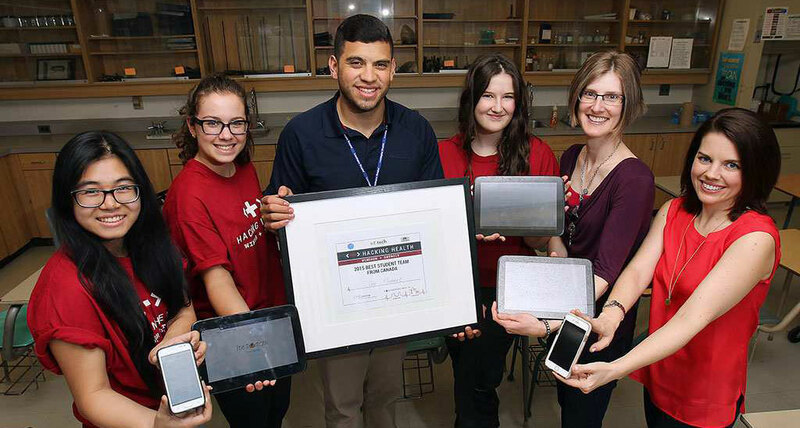 “Learning to bring a product to life, seeing the transformation, that’s hard to replicate in a classroom,” said Omstead, who along with fellow teacher Carrie Grossi oversaw the high school component of the team. Zain Ismail, Leamington hospital’s lead on this project as manager of innovation and partnerships, said he plans to tap students as a future resource. The next step in the project is to turn the web-based app into a mobile app. That will take some money and time. Ismail is confident the app touches so many of the right bases that financial backing won’t be an issue. He’s already been contacted by a group at the University of Michigan interested in knowing more about the project.